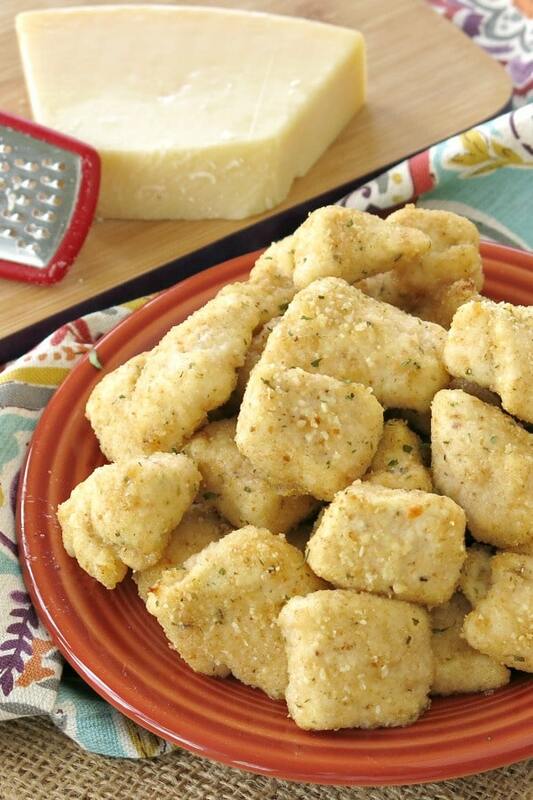 Parmesan Chicken Nuggets have just 5 ingredients and are ready in under 30 minutes. Follow our easy process to bread chicken and you’ll be enjoying these delicious bite-sized nuggets in no time. Yes, they’re kid-friendly, especially when dipped in marinara. 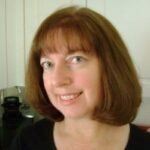 But, I’m a mom and I love them too…if they’re lightly breaded and bake in the oven so they’re a bit healthier. The kids eat them for dinner and I add them to a salad. It’s not a new concept at our house. We do this with Oven Baked Chicken Tenders with Coconut and Pecan too! By the way, this recipe is a twist on Broiled Scallops with Parmesan Crust, except that we used diced chicken breasts! Use boneless, skinless chicken breasts to make nuggets (and chicken fingers too!) We use poultry shears instead of knife. Cut chicken into strips and then cut strips into bite-sized pieces that are about 1½ inches. Be sure to cut chicken pieces about the same size so the nuggets will cook evenly. Tip: Blot the chicken pieces dry before beginning the breading process so the Parmesan cheese and breadcrumbs will adhere nicely. The following process is based on the one we developed at our Meal Assembly Kitchen. As you might imagine, it would be quite a mess to follow the typical breading process for hundreds of customers each day. It works! 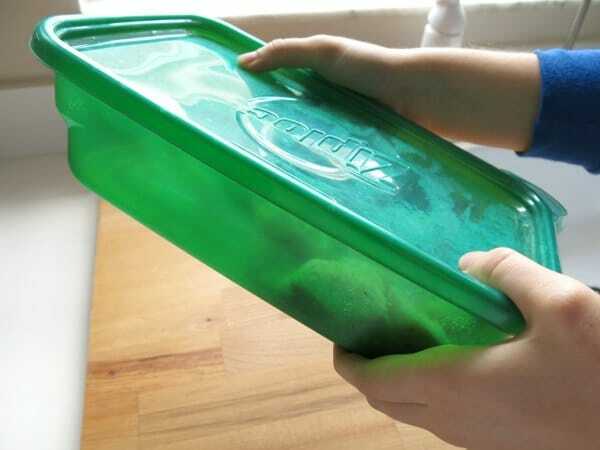 You’ll need 2 large containers with lids or 2 large freezer bags that seal. Combine melted butter and olive oil in one large container. Add chicken pieces and stir to coat the chicken. Add breading ingredients to a second large container, close the lid and shake to combine. Lift chicken pieces into the breading container, allowing excess butter to drip off first. Close the second container and gently shake. 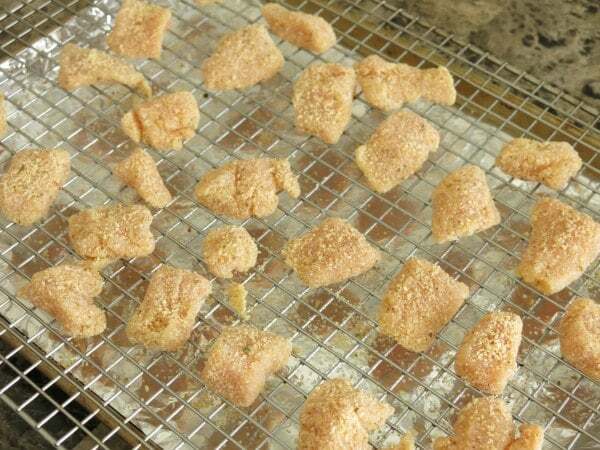 Move nuggets to baking sheet and press any leftover breading over spots that are not covered to your liking. If you’re doubling the recipe or use small containers, then follow the process in batches. Cook chicken nuggets on a cookie rack placed on top of a cookie sheet. This allows air to circulate on all sides of the nugget and prevents the bottom from getting soggy. Adjust the breading ratio to use more breadcrumbs than Parmesan cheese! See suggestions in the next section. The ratio of breadcrumbs to Parmesan cheese impacts the texture too. We used a 1 x 1 ratio, which results in a cheesier nugget. Use 1/2 cup of breadcrumbs and 2 Tablespoons Parmesan cheese for an even crispier version. The breading for Paprika Parmesan Baked Chicken Tenders would also be delicious on nuggets. We eliminated breadcrumbs entirely when we made Parmesan Cauliflower Bites, but we’ve never tried it with chicken! 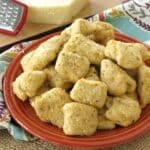 Freeze Parmesan Chicken Nuggets before or after cooking them! Option 1: Cook nuggets and allow them to cool. Place them in a single layer in a freezer bag. Once frozen, the nugget breading should stay on and the bag can be stored upright. 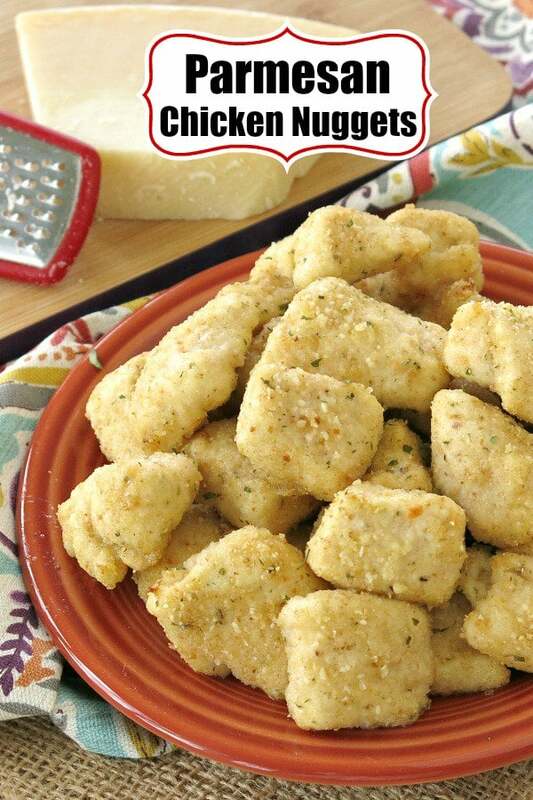 Re-heat nuggets in a microwave until heated through, about 2-3 minutes for one serving. Or, cook them in the oven for about 15-20 minutes. Option 2: Prepare the nuggets, but don’t cook them. Place them in a single layer in the freezer. We use an aluminum tin with a lid. Keep them in a single layer until you’re ready to cook them. Cooked from frozen by adding about 10 minutes to the cook time. Or, defrost them overnight in the refrigerator and cook per the directions. We often do a combo of both options when only 5 or 6 nuggets are needed. Microwave for 2 minutes and finish in the toaster oven! 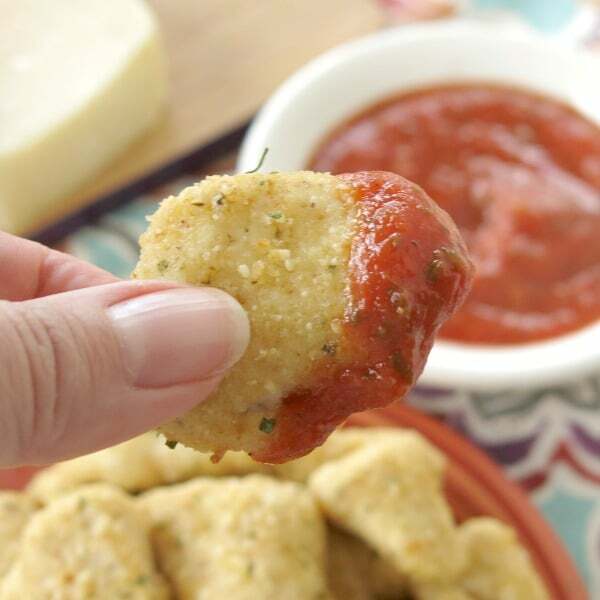 We dipped our Baked Parmesan Chicken Nuggets in marinara sauce! But, we’d love to hear what you would use! Parmesan Chicken Nuggets are lightly breaded and bake in the oven for a healthy version that's quick and easy too! Pat chicken dry with a paper towel. Combine melted butter and olive oil in a large bowl. Add chicken pieces to bowl with butter/olive oil mixture. Turn chicken in bowl until all pieces are coated with the buttery mixture. Add remaining ingredients to a separate large bowl with lid and stir to combine. Lift chicken pieces coated in butter into bowl with breading, allowing excess butter drip off before adding each piece to the breading bowl. Seal breading bowl tightly and gently turn until chicken is coated with breading. Place chicken on a baking sheet coated with cooking spray. Press any breading left behind in the bowl over the top of the nuggets. Bake for 15 minutes or until chicken is cooked through and no longer pink in the center. So wish I’d had this recipe when my kids were young – brilliant! I love the different breading options!!! Thanks! It’s definitely a time-saver! I love how easy and delicious these are! Thanks! I’m glad you like them!